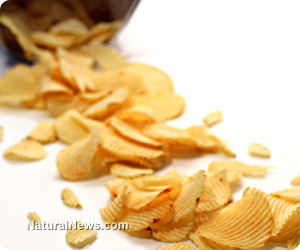 NaturalNews) Regular readers of Natural News, as well as scores of others in the U.S. and around the world, have long since known of the health dangers of junk food – foods that can most generally be described as those which contain empty calories and excessive amounts of substances known to cause harm to the body. But why does junk food remain so popular? What makes tens of millions of people consume it daily, even if they are well aware of its health and dietary pitfalls? Well, part of the reason is by design – that is, the way such foods were designed to appeal to our senses. Think of the old Lay’s potato chip commercials; “No one can eat just one.” In many respects, that’s what junk food does: It is designed to create a sort of can’t resist mindset, which is a) why junk food makers have thrived, even in a culture of health; and b) why so many Americans (and increasingly, citizens of other countries) are seeing epidemics of obesity, diabetes, heart disease and other medical conditions. The “cheese that goes crunch” now comes in no fewer than 17 flavors. Sensory-specific satiety also became a guiding principle for the processed-food industry. The biggest hits – be they Coca-Cola or Doritos – owe their success to complex formulas that pique the taste buds enough to be alluring but don’t have a distinct, overriding single flavor that tells the brain to stop eating. Like other industries, junk food makers have become good at pitching questionable “solutions” to self-created problems. Consider this example. The industry fills most all of its products with salt, but one of the industry’s chief demographics, baby boomers, are aged now and trying to cut back on excessive salt. Is that a problem? No – an opportunity. Rather than genuinely lower salt content, per se, junk food makers are seeking to develop a “designer sodium” which they hope will reduce salt in their products by as much as 40 percent. If that occurs, baby boomers will reason that, hey, salt content is much lower so we can eat more junk food and feel better about it. — Finding a product that sells, then finding the cheapest ingredients you can to make it profitable (think Lunchables, which were developed in the 1980s and initially lost money until Philip Morris, which invented them, began filling them mainly with iterations of corn and soy). — Your brain, surprisingly, reacts to sugar and cocaine in much the same way, so when you say things like, “This [fill in chocolate bar name here] is like my candy crack!” that is closer to truth than most people realize. — The breakfast drink Tang was not developed for the U.S. space program but was used by NASA nonetheless because it was the perfect low-fiber drink (General Foods developers only perfected the taste of Tang after removing all the vitamins and minerals normally found in real orange juice).